What a strange world we live in, where everyone is left to their own devices to find out how to understand life itself and what makes them happy. 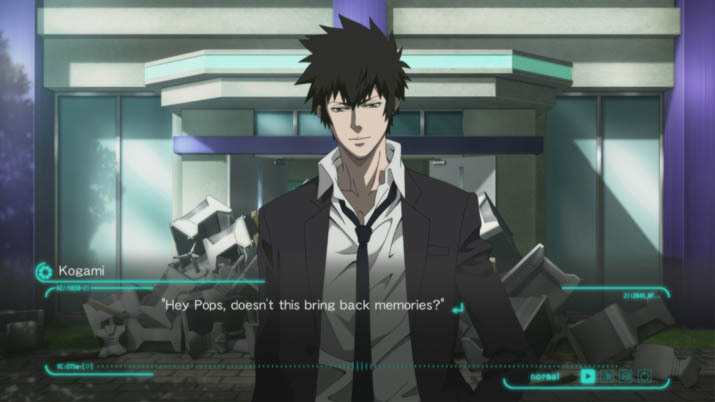 In PSYCHO-PASS: Mandatory Happiness (PP:MH), which takes place in a futuristic Japan, people seem to have it better. Through technological advance, a centralized computer system called Sibyl is able to assess people’s innate capabilities and assign them a path which leads to the greatest amount of happiness, for themselves and society as a whole. 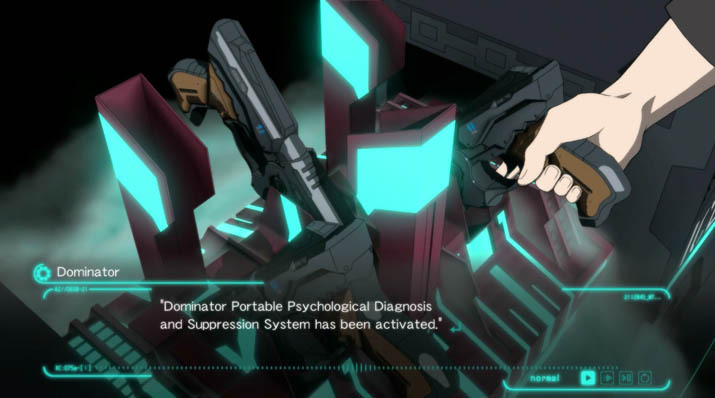 The result of Sibyl’s assessment is called a person’s Psycho-Pass. One component of the Psycho-Pass is “crime coefficient.” Should it rise above a certain value, the citizen is at risk to commit an illegal act, and the Criminal Investigation Division (CID) comes into play. It’s a police force comprised of inspectors (the brains) and enforcers (the brawn) which track down people with high crime coefficients. Once apprehended, CID sends the potential criminals either into treatment or, when irredeemable, kills them. This is where the player gets introduced into the action. You join a team of the CID, Unit 1, and investigate crimes to track down citizens with high crime coefficients. In the beginning, you get to choose to join the team either as inspector Nadeshiko Kugatachi or enforcer Takuma Tsurugi, each with their personal take on working for the CID. As the investigation proceeds, the team stumbles upon the case of a hacker which seems connected to the recent escape of an android who apparently has developed a life of its own. The crimes the android is involved in--be they good intentioned or malicious--put the members of the investigation team before complicated moral conundrums. For example, a battered infant, a victim of a crime the android is involved in, is found with a high crime coefficient and technically the directive is to neutralize it. However, the team is hesitant. Especially that sequence with the infant sent me into ruminations which lasted even after I had finished the game. What is the greatest good for the largest number of people? What if realizing a directive to bring that about (i.e. killing a baby) destroys the happiness of the one enforcing the directive? These are the moral questions the franchise deals with and which the fans appreciate. It comes down to the opposition of free will and pure reason. You think about these conundrums as the story unfolds and begin to examine the principles on which you base your life. I have encountered this only very seldom in games. Often less profound entertainment is the primary objective of game designers, which is a safer bet to please an audience. The intent to spark deep-reaching ruminations about the meaning of it all the audience sometimes perceives as a downer. PP:MH intentionally wrestles with these questions and in doing so stands out positively. Immersed in the story, you follow the action by looking at still images of the characters and reading the dialogue at the bottom of the screen. There I had a first moment where things didn’t seem too catching. That the player stares at still images isn’t off-putting as long as two characters are conversing and the dialogue scrolls through. However, in sequences where we are to understand that the characters are physically fighting, the screen is blank, and a description in the form of a monolog tells the player what is going on. That is very dissatisfying. The ability for the player to make choices on behalf of his character would counteract this lack of spectacle; however, here another problem arises: you are left to simply hit enter for the first ten minutes of the game, until eventually there is a decision you can make. In general, the occasions on which you can influence the action are far apart so that PP:MH feels like a visual novel which only needs the player to press Enter. As I played it once, late at night, after a long day of reviewing, I kept nodding off while trying to follow the dialogue. My somnolence was probably also due to the dark, contemplative atmosphere created by the images and the somber musical score. At one point, a suspect is neutralized and in the Psycho-Pass anime series that usually happens as a gruesome spectacle of carnage. In PP:MH, however, there is simply a black screen and traumatized characters afterward. I kind of wanted to see that. The subtitles are in English, yet the characters’ voices are in Japanese spoken by the voice actors of the anime. I didn’t have a problem with that, although that is something one needs to consider before buying. Either you learn Japanese (why not? ), or you will be reading all the dialogue in-game. There also never is an explanation of the key bindings. It took me a while of trial and error to figure out which keys do what. Eventually, I even found an “Extra” menu where you can play a mini-game of Chibi Psycho-Pass, a 2048-like tile puzzle game. As a reward, you receive in-game currency with which you can unlock concept art. How effectively PP:MH can grasp a player’s attention merely by its interface and the action on the screen is a point of contention. Yet, it is undeniable that there is substance behind the still images and the endless lines of dialogue. The title spins an intriguing story of speculative fiction which involves the player in certain crucial moments and sparks tough questions about happiness and its relation to self-determination. Packaged into a crime thriller these philosophical ruminations make for a gripping graphic novel which complements the franchise excellently.